Beijing, New York: Huawei Technologies Co’s chief financial officer (CFO) was arrested in Canada over potential violations of United States sanctions on Iran, provoking outrage from China and complicating thorny trade negotiations just as they enter a critical juncture. Wanzhou Meng — also deputy chairwoman and the daughter of Huawei’s founder — faces extradition to the US, said Ian McLeod, a Canada Justice Department spokesman. She was arrested last Saturday after the US Department of Justice in April opened an investigation into whether the telecommunications giant sold gear to Iran despite sanctions on exports to the region. News of Meng’s arrest provoked an immediate protest from the Chinese Embassy in Canada, demanding the US and its neighbour “rectify wrongdoings” and free Meng. Her arrest is likely to heighten tensions between Washington and Beijing days after the world’s two largest economies agreed on a truce in their growing trade conflict. Meng’s father Ren Zhengfei, a former army engineer who was named China’s top entrepreneur of the past 40 years, has won acclaim at home for turning an electronics reseller into the world’s second-largest smartphone maker and a major producer of networking gear. Its ambitions range from artificial intelligence and chipmaking to fifth-generation wireless. Its massive push into future mobile communications has raised hackles in the US and become a focal point for American attempts to contain China’s ascendance. Shares in several of its suppliers, including Largan Precision and MediaTek, fell. 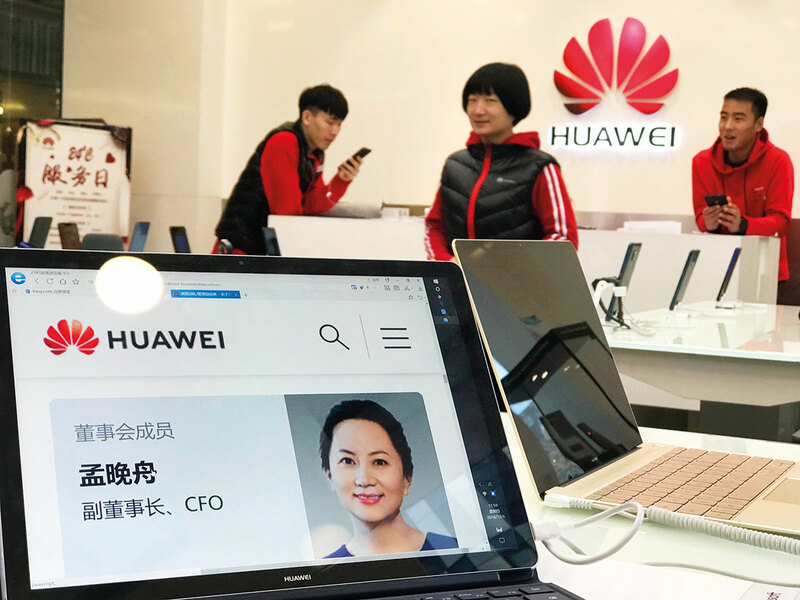 “Tencent and Alibaba may be domestic champions and huge platforms in their own rights, but Huawei has become a global powerhouse,” said Neil Campling, an analyst at Mirabaud Securities. It is “5G standards that are at the heart of the wider IP debate and why the US and her allies are now doing everything they can to cut to the heart of the Chinese technology IP revolution”. The US Justice Department declined to comment about the arrest. A spokeswoman for Canadian Prime Minister Justin Trudeau referred questions to the country’s Justice Department. Senator Chris Van Hollen, a Maryland Democrat, said that Huawei and ZTE “are two sides of the same coin - Chinese telecommunications companies that represent a fundamental risk to American national security”.